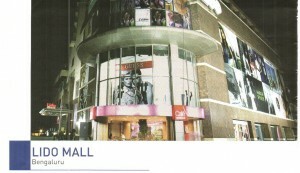 Lido Mall is a lifestyle and fashion mall located in Bangalore city at Ulsoor, five minutes away from the bustling M.G. Road and the upmarket Indiranagar. It’s the one-stop destination for all popular international brands. Spread over an area of 57,000 sq. ft and two floors, the mall houses 13 top notch national and international brands like Marks, Spencer, Guess, Next, The Body Shop, Etam, AND, Lee Cooper, Jealous 21, Lilliput etc. The Body Shop store in Lido Mall has recorded the highest sale amongst all the stores across the country. Some of Bengaluru’s glitterati are regular visitors at Lido. The mall is in close proximity to the upmarket residential areas like Richmond Town, Victoria Layout, Cambridge layout, Fraser Town, Brigade Road and Kumaran Park. Lido Mall also has a Fame multiplex, along with restaurant options like Noodle Bar, Spaghetti Kitchen, Moti Mahal and a food court called Food Talk. You can View the List of Stores and Shops at Lido Mall, Bengaluru here.